Let me share an online publication I stumbled into. “While the world is evolving, women are still lagging behind when it comes to leadership roles in business. Today, only 26 women are in CEO roles at fortune 500 companies, making up 5.2% of the female population, according to a report by Pew Research. The stats stay virtually the same for women CEOs of fortune 1000 companies at 5.4% showing that there is little movement of women making up these high-ranking positions as company leaders. 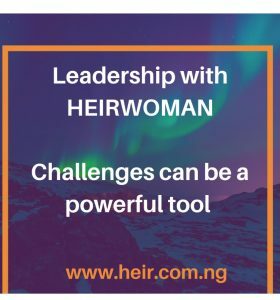 We could go on and on from now till eternity enumerating challenges that hinder the rise of individuals in leadership especially women but it’s not going to get anything solved. While it may be true that to solve a problem you must first identify what the problem is, I dare say on this matter that the existence of successful women leaders in different fronts of society no matter how few they currently are, is enough proof already that our only barriers exist in our minds. Whatever challenges a person or a group of persons have defied, ceases to be a collective challenge and becomes a personal challenge that must be overcome by you as an individual and victory begins in your mind, your thinking, your mindset. At the end of the day, you are your own challenge and you must rise above yourself by renewing your mind and delving into acute personal development. You are the artist of your life, don’t give the paintbrush to anyone else. I wrote you a little poem. Read it, know it, believe it and never forget it. Dream big sweetheart, dream big. Pursue your dream dear, pursue your dream. Defy the odds, there’s always a way around it. Refuse to be limited in a world of limitless possibilities. Don’t under develop it, don’t underuse it. Train your mind to see possibilities alone. Build yourself to deliver ten times the required result on a job. Acquire skills needed – employability and life skills. The good news is that the lid is lifted and the cover is removed. Therefore spread your wings and fly. Again I say, the lid is lifted, the cover is removed, spread your wings and fly! KC EZE is the president and pioneer of The Shift Africa Youths Initiative, an NGO that teaches and empowers young people on leadership and personal development. He is a collaborative leader with strong communication and interpersonal skills built over his 11years experience in managing campus and youth ministry. He is also a co-pioneer of Champions Youth Foundation International which has been serving spiritual, leadership and life skills to young people in secondary and tertiary institutions since 2010. He is a dynamic TV host with ACNN (Anglican Cable Network of Nigeria) and a husband of one female wife. This entry was posted in Advice, Continuous Development and tagged career, career advice, career goals, Human Resource, leaders, leadership skills, womeninbusiness. Bookmark the permalink.